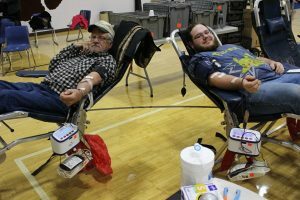 Pictured from left: Moundsville resident Jim Hudkins and JM junior Clint Eisenhauer give blood during the blood drive last Monday. Students, faculty and staff along with community members gathered at John Marshall High School on Monday, November 5, 2018 to donate blood. The JM Blood Drive Club teamed up with the Central Blood Bank for the school’s annual Fall Blood Drive. More than 100 useable units were collected. Three blood drives are held at John Marshall every school year as a way for students to give back to their community and to raise money for post-secondary education. The more blood collected leads to the Central Blood Bank donating more money toward student scholarships. The hard work of the JM Blood Drive members and their faculty advisers Alexa Bushovisky and Kathleen Loughman is being applauded in another way. For the second year in a row, the JM Blood Drive Club has earned a spot in the Central Blood Bank’s top 20 organizations that make a difference. The group received a Community Blood Program Leadership Award on Tuesday, November 13, 2018 in Pittsburgh at the Carnegie Science Center.